Stem-cell scientists show that petri dish-built matrices of vessels integrate well with existing heart tissue. 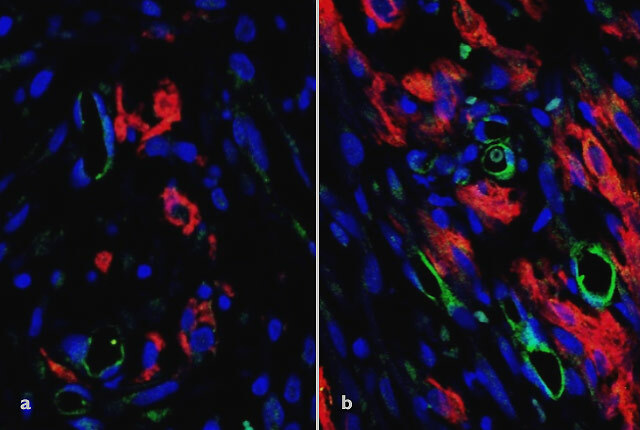 Histology slides show murine heart at five days post-implant a) with conventional non-perfusable vessels and b) with patterned perfusable cardiac construct. Advances in stem cell research offer hope for treatments that could help patients regrow heart muscle tissue after heart attacks, a key to achieving more complete recovery. Scientists today report success in creating functional blood vessels in vitro for hearts of rats that had sustained a heart attack. The journal Nature Communications published the paper, whose lead authors are Ying Zheng and Charles Murry of the UW Medicine Institute for Stem Cell and Regenerative Medicine in Seattle. “To our knowledge, this is the first demonstration that building organized blood vessels with perfusion outside the body leads to improved integration with host blood vessels and better tissue blood flow,” said Zheng, a University of Washington associate professor of bioengineering. The scientists set out to show that by growing stem cell-derived heart tissue in a petri dish, with attention to blood vessels’ construction, they could improve the tissue’s incorporation with existing heart vessels. Disruption to blood flow during a heart attack leads to significant loss of heart muscle and heart function. Heart muscle grown from stem cells must not only survive and integrate with the host tissue, but it must also restore adequate blood flow, explained Murry. He is a UW professor of pathology, bioengineering, and medicine/cardiology. The research team used human stem cells to create a vascularized construct, or patch, with a functioning network of blood vessels that mimics the vasculature of a human heart. Optical microangiography imaging techniques developed by Ricky Wang, a UW professor of bioengineering, revealed that blood flow within the grafts was twentyfold higher than has been reported for any other such graft. This suggested that nurturing the tissue in the lab had a meaningful benefit for the heart cells before they were implanted into the rats’ hearts, the researchers said. The work was funded by National Institutes of Health grant (R01HL141570).